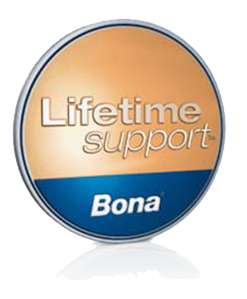 Bona cleaner should be used to remove tough stains and spills without dulling the finish of your wood floor. - Don’t use ammonia cleaners or oil soaps on a wood floor — they’ll dull the finish and affect your ability to recoat later. - Don’t wet mop or use excessive water to clean your floor (wood naturally expands when it’s wet and can cause your floor to crack or splinter). For information on steam cleaning hardwood floors, see our blog post on Floor Talk. - If and when your hardwood floor begins to look like it belongs beneath the feet of gold miners in an old western saloon, it’s time to consider screening and recoating. - Screening is the process used to abrade or grind down your floor’s polyurethane finish. Next, fresh coats of urethane is applied. to all the advice, information and practical assistance you can ever need. of your floor. Some people call it peace of mind. We call it Bona Lifetime Support.